Finnish wind farm operator Suomen Hyötytuuli acquired a fully developed project in Polusjärvi from ABO Wind in early October. The wind farm disposes of all necessary permits for ten wind turbine generators with a total height of 235 meters each and grid capacities for up to 50 megawatts. This is the first time that ABO Wind has sold a Finnish project prior to construction. The project developer, headquartered in Wiesbaden, Germany, has already developed and built five wind farms in Haapajärvi (2015 and 2017), Silovuori (2016), Ratiperä and Muntila (both 2017). “Selling ready-to-build project rights is an interesting option for us, because we have a tightly packed project pipeline in Finland”, explains Aapo Koivuniemi, Head of Development in Finland. In addition to the project now sold in Polusjärvi, ABO Wind has a pipeline of Finnish projects totalling 200 megawatts that are ready for construction. A further 300 megawatts are in the development phase. 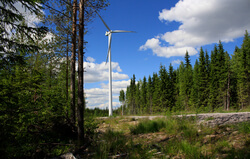 With 92 megawatts connected to the grid to date, ABO Wind is now Finland's sixth-largest project developer for renewable energy. "Considering that we have only been active here for five years, this is very remarkable", says Koivuniemi. There are now 13 employees working in the Helsinki office of ABO Wind Oy. The Finnish subsidiary of ABO Wind AG has already made a significant contribution to the corporate success of the group in recent financial years and will continue to do so in 2018. EDF Renewables North America today announced they have entered into a Build and Transfer Agreement (BTA) with Tucson Electric Power (TEP) for the 247.4 megawatt Oso Grande Wind Project. Private investment house Ardian has announced to invest €300 million to build a wind farm in Åndberg/Härjedalen, Sweden. Ardian acquires the development rights of the project from OX2, a leading Nordic renewable energy developer.